Suicide rates rose more 10 percent in Florida over a 17-year period, a new government study showed Thursday. "Rates were up 10.6 percent from 1999 to 2016 according to the report from the Centers For Disease Control and Prevention." OK and yet, after being in Florida for 14 years, trained by most of the "experts" offering Crisis Intervention Training, topped off with being in this work for over 36 years, I am left with a gnawing thought. With all we've know for all they years we've known it, how has it gotten worse? How is it that with so many running around Florida, and the rest of the country, screaming about suicide awareness, have not managed to learn anything before they decided to share their stunning lack of knowledge? It isn't that we lack real experts. You know, like the ones who taught the classes I took, wrote the manuals I read and yes, gave presentations on what to do and when to do it. Unfortunately, I have been to too many events where the self-claimed experts did not know much at all. Like the ones running around screaming about veterans committing suicide, using an "easy number to remember" as if that was all they were. Apparently these folks did not think they needed to know anything beyond what a reporter put into a headline. Well, the above is a great example of what happens when people preach what they did not take the time to learn. Salvatore Gintoli spoke frankly to law enforcement and other first responders about mental illness and suicide — issues that often go undiscussed but are widespread. Gintoli, a senior director of crisis services at Stewart-Marchman-Act Behavioral Healthcare, was leading a course that aims to provide the skills to recognize mental health issues and reduce the stigma that surrounds them. A report released last week by the Center for Disease Control and Prevention was a stark reminder that suicide remains an intractable public health crisis and that there is still much to be done in addressing mental illness within the U.S. 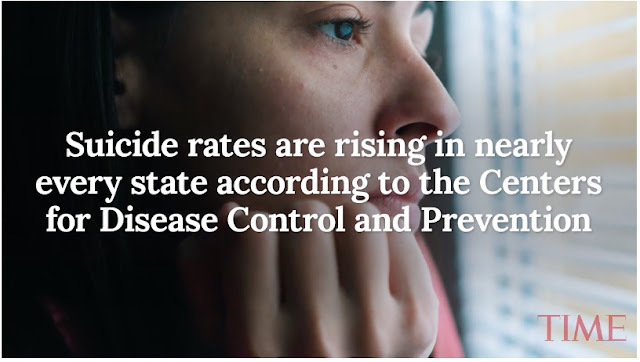 According to the report, the suicide rate increased 25.6 percent nationwide from 1996 to 2016, with only one state — Nevada — seeing its rate fall. Florida’s suicide rate increased 10.6 percent, though most states saw larger jumps. The numbers came out at the same time people were mourning the deaths of celebrity designer Kate Spade and chef Anthony Bourdain, both of whom committed suicide. Their sudden deaths have received widespread attention, with fans of each expressing dismay and fond remembrances across social media. “What happened is tragic,” said Kim Beck-Frate, licensed mental-health counselor in the traumatic loss program for Halifax Health Hospice of Volusia/Flagler. So now were are left with veterans, first responders, families, all ready to accept the fact the jobs they decided to do could cost them their lives but end up facing the job itself was more dangerous off the clock and we wonder why. Too bad that I trained way back in 2008 to 2010 on how to help First Responders right there on the East Coast. 2008 with the International Fellowship of Chaplains, 2009 with Center for Disaster and Extreme Event Preparedness and a lot more conferences just like the one above. How is it that we seem to have gone backwards?